Click through to item; Dress: ASOS. Shoes; Zara - similar here. Now, music, concerts or 'gigs' as the cool kids call them aren't really things I've ever mentioned on here before. I tend to stick to things I know. Don't get me wrong, I love music, but I wouldn't say I have particularly 'good' or 'individual' taste. I'm raising this because I'd had my eye on this red, organza dress for a few weeks but held myself back because I had nowhere in particular to wear it and no real need of it. 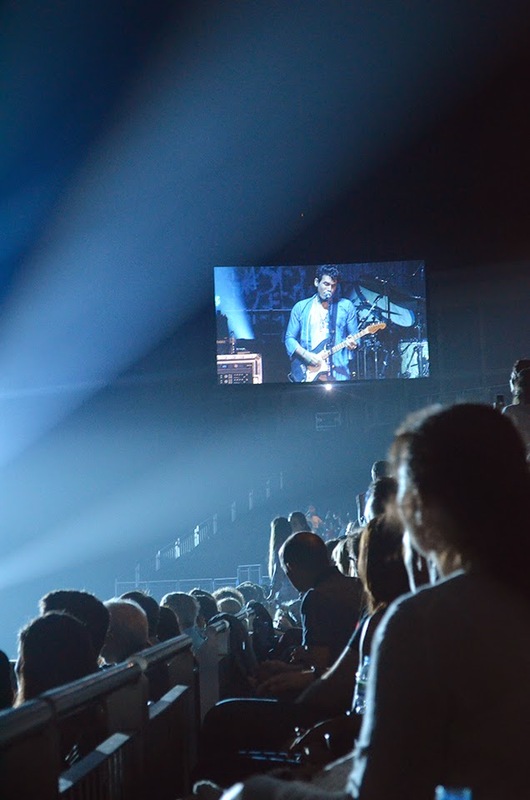 However, when the John Mayer concert came along I knew the time had come. I always dress up for John. We're on a first name basis now. In the sense that I know his but he doesn't know mine. My friends in real life know that I have a borderline-peculiar love for John Mayer and have done since I was about 12. I've seen him live 5 times and I've also stalked him just a bit. Just casually, you know. Casual stalking. The kind you probably can't get arrested for. He came to speak at The Oxford Union a while ago, which is a kind of 'club' in Oxford where notable people come to talk and there's a chance I hysterically chased followed him to his private room, waited outside like a lunatic and got his autograph. It may have happened. I also may be mildly ashamed but also proud. We'll move on now. Im good thanks, hehe! Great blog post Arabella as per usual, your style is stunning! I'm great thank you! Annnd I haven't been up to much, other than endless amounts of washing up and a boring 9-5, oh what a glamorous life! From the few people I can spy in the crowd you were definitely the best dressed there, I reckon John will be calling soon! Very pretty red dress - Love your style! I'm great and I just passed my Baccalauréat exam! It's lovely of you to ask, gets you more connected with your folowers! And I love your outfit! You look so glam and I bet if he had saw you he would have fallen head over heels for you! Great post and would like to see more music posts from you! That dress is so gorgeous! Ha your tale of following him to his dressing room made me laugh! Such a great dress, and the setting is perfect! Love that dress! You rocked it well!